I did two or three keratin treatments in 2011. It was at the time when I started to grow my hair for the first time. (I have always had thin-normal hair so it was really bad on me). I started notice bad hair loss around March of 2011, I had also gotten out of a long relationship so the stress from that lead me to assume it was the only culprit to my hair loss. I had also bad acne for years and decided to go to a new dermatologist, and he prescribed me the very controversial drug, Accutane for 6 months. He told me the hair loss I was noticing was just stress, and that one of the symptoms of the drug might be hair loss as well. I was stupid, so I took my chances. So massive stress + Accutane+ Keratin= Nightmare. After my 6 month treatment, my hair was finally long, but thin. I could see my scalp more and more every week. It was winter so I used a lot of winter caps. By January 2012 I had realized that the culprit was the Keratin, or at least the main factor. I found this site, read hundreds of stories and Chopped off my hair. I was of course devastated, I always wanted long hair and the first time I do it, I mess everything up. I went back to my dermatologist a few more times. He told me it was just the Accutane, it takes another 6-8 months to get out of my system. Then he tells me I might have a scalp infection, gives me a worthless gel. Then he tells me its Male pattern baldness, as well as my regular doctor. Of course none of them has heard of Keratin and I felt like many of you do, like the only one in the world going through this. Now even though I am a guy, I still went through the same things you ladies have been through. Now even though I am a guy, I still went through the same things you ladies have been through. I knew my family had a history of male pattern baldness, especially my father's side. But I knew he didn't start losing his hair until he was at least 30, and I'm only 22. So I knew for sure it was the keratin. Anyway, I didn't start getting serious about finding a solution to this until January 2012 when I cut my hair. From some research I did, Keratin is a type of animal protein, and when used (heated into the hair) it says inside the hair locked in. So no matter how many times we washed with heavy sulfate shampoos there would still be keratin left in small traces in our hair. So cutting it was the biggest thing I suggest. I understand that’s a huge No no for women, but like I said in a few posts before, hair is hair, women are beautiful no matter what hair style they have, you just have to know how to work it. I had been taking some Biotin supplements for a month or two while on the Accutane so it probably helped a little, more my nails grow. I started Rogane for a good 4 months. Saw some growth but the greasy crap had me tired, and research says that if you stop using it, all the hair you grew with it will fall out, so I intended on using it as maybe a restart on my hair or as a boost to re-growing the hair I once had that was still alive. I also did research into Male Pattern Baldness, because I knew one day I might have to face it, even though it's hard to tell, sometimes it skips a generation, sometimes it doesn't, but I decided to be prepared in any case. (Women also have the equivalent of male pattern baldness, I forget the technical name, but if some women here know they have it or will have it, this whole keratin might of sped up that process). DHT is the chemical/waste of some hormone men give off, and it weakens the weak hairs that are on top of the scalp (not the tough side and back hairs) So DHT blockers were on my list. (My doctor prescribed me Propecia, which is what most men take with MPB but lots of research is coming out that it causes impotence or it messes up a mans libido. And seeing that I apparently like to attract all the bad side-effects of every medication I take, I took no dam chance and flushed those pills down the toilet. I decided to go a natural way. Do some research and there are a lot of natural alternatives out there. There is a laundry list of herbs, fruits, and vegetables that are natural DHT blockers. So when I found a good product that had a lot of the ingredients I was looking for in them, and if the product had a good amount of good reviews, I bought them. One of them is Hairomega 3-in-1 which has significantly reduced shedding and increased hair strength in just a month. Unfortunately because of money problems I haven't had the chance to use them for more than a month's time. Get a new job, s o now I can. :) They also contain biotin which is great, but an extra biotin pill a day wouldn't hurt. I also knew that stress is a big factor in hair loss. So Inositol came into play after a few days of research. They are used to treat people with OCD or people with severe depression. They use I believe more than 4 pills a day for people with those conditions. So I stick to 3 pills 500mg each spread throughout the day or taken all before bed time or work. They did help a lot. After a few weeks I don't even have to take them daily, I take them now whenever I know it might be a stressful day or if I've had a bad day. (The Hairomega has Inositol too, but not enough to feel an effect). Since no one knows the true reason(s) for why this happened, I've come up with a few theories from some of the research I've done. - When the keratin is heated in the hair, formaldehyde is created as a biproduct (even though the box says formaldehyde free, heating up the solution, can create formaldehyde according to some hairstylists and dermatologists) and as you know it is toxic and could of gotten in our lungs if the room is not well ventilated and into our skin and scalp giving us some sort of toxic reaction. - We are allergic to Kertain. My sister and mother did keratin the same time I did it, my mother did it to me, and they were fine. We may be all allergic in some way to it, a long term allergic reaction could be a possibility. - The Keratin solution touched my scalp and burned: this happened not only to me, but to a lot of people here. When applying the keratin, it got on your scalp (and the directions say don't get it on the scalp!) and you just left it, it tingled. And when you heated the hair up, it burned a little, maybe a lot. And the next day you had loads of dandruff, but in reality it was just your scalp shedding from the bad keratin burns you had, (there are other chemicals in there that burn!) And you use head and shoulders because you think you have dandruff all of a sudden. And it goes away in a few days. Yea I know, same thing happened to me. We probably shouldn't of gotten it on our scalps, let alone do the dam thing. -There are a number of different possibilities, but those three are my theories, maybe they are all wrong, I don't know yet. Hopefully there will be medical research done soon to determine a cause. Biotin 2000-6000mcg daily. (Used different brands, GMC has good selections) $7-20 depending on the brand and dosage. Protein shakes 1-2 shakes daily. (Optimum Nutrition 100% Whey Gold Standard. This is to get some better and more natural protein into our hair and give it strength, since hair is basically made of protein) 2lbs container last me a month, $30. Going to get a 10LBS soon. Hairomega 3in1. Great for guys, I don't know if it works for women, there might be alternatives, do some research if you know you have baldness in the family, but if you don't and its safe for women, I suggest taking it, it still good for strengthening the hair and giving it some good nutrients. $22 a bottle, last a month. Any type of liver or kidney detox system/pill would be great. I haven't started mine, but it wouldn't hurt to get as much crap out of our systems as we can. And seeing that the liver cleans our blood, and hair grows on blood circulation to the head, I want my blood as clean as possible for my scalp and hair. Mostly used to boost regrowth, rogane for women is available. $40 for 3 bottles. T-Gel. For those with bumps or acne on scalp and itch. It is amazing. I used it daily for 2 weeks straight. Then once every couple of days. $11 generic brand. 1% concentration. Ideally I would want to take the Hairomega, Biotin (small amounts seeing that there is already biotin in the hairomega) 3 protein shakes a day and a good multivitamin. And one thing that works. EATING HEALTHY! I am not going to say I went straight vegan and just ate fruits for the past year. I still eat the same crap I do, but not nearly as much. I stopped drinking soda for good, I never drink alcohol, and all I drink is Milk, Water and juice. Mostly Water. The whey protein I buy is great if you do daily exercise, but it’s a super fast burner, so it gets used up quickly, meaning your body burns it up fast. I just found out that Casein Protein is a slow protein burner. This might give us better results, I will buy soon and update. A combination of the two daily is recommended from the research I've done. Oh and yea, exercise! I probably don't hit the gym anymore because of college and work, but I get in my push-ups every day and i walk long distances every day. If you don't feel out of breath at least once a day, you’re not doing anything. Nearly impossible. How are you supposed to not be stressed, you stress because we lose hair, yet if we stress we lose hair. It’s insane. After a while I just got mad at the whole thing. cut my hair off was a big confidence boost and ladies, if you cut it to a good length or a buzz cut, then you will feel confident. I don't know but any women that can cut off their long locks for a Emma Watson or Anne Hathaway short cut gains so much confidence. Try it out! Hair grows back remember! You have to get the keratin & the other crap out of hair. Also, the Inositol helped me so much. Try it out, consult with a doctor if you must before taking it. I'm not going to sugar coat this. I will be straight and simple. This whole thing, looks like its going to take over a year, already has for me, maybe 2 or 3. Who knows! But if we don't learn how to control our emotions, and find out different solutions or each of us that work or each other, our hair will just wake up on our pillow every morning instead of on top of our heads. I also feel self conscious every day, Ilook at peoples hair and feel like crap, I look at bald guys and think, Oh my god will I look like that? And honestly, I just am thankful that Istill have enough hair on my head that I can carry on the rest of the day, not feel like I'm completely bald, know I have coverage. It might be thin, you can see my scalp if there is a light right above my head, but no one goes around with a spotlight on top of their heads all day. that’s only in our bathrooms. Go out, enjoy life, exercise, meet new people, eat right, stay healthy, cut the hair! don't towel dry your head, tap dry or air dry, stop using blow driers! Stop changing your hair color at least for a year! Stop putting crap in your hair that you don't need. You are already naturally beautiful. 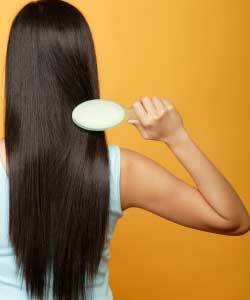 Protein or biotin shampoos are good, don't use any more keratin products or anything containing keratin, read the labels! And control that stress. Get mad at it and take over.